Map of Military Installations, Ranges, & Training Areas in the U.S. I came across a fascinating map which may be of interest to some of you. United States military bases, installations, ranges, and training areas. It is interesting to know what may be nearby in your own region, as well as general knowledge. The original file was huge, so I re-sized the map image down to 6000 x 5000 pixels (about 6MB) for more practical usage, view-ability, and download-ability. All point locations are from best available unclassified sources. The locations shown encompass both owned and leased lands. Not all installations, ranges, and training areas are depicted on this map. It includes the Army, Air Force, Marine Corps, and Navy. It was a secret for a long time but during the cold war, nukes were stored at a facility near where I live. Freedom of information gave the spot and weapons were long since removed and buildings destroyed. You never know what is in your back yard until you are stopped by military when hunting or traveling. If this happens in your area, be assured they don’t want you to know what is going on because it is most likely dangerous to know. It is probably still secret but nuclear weapons are built 7 stories underground very near a large city in Southern Ohio. I don’t mean finished bombs and missiles but machined radioactive components. Good info to have tucked away in my electronic library! Where’d you find this? The copyright looks to be from about 2008. Ken, I don’t see Area 51 on the map. Must not be “public” information yet even though we all know it is there. It’s part of White Sands in Nevada. White Sands is comprised of many different Areas. You can visit. The glass made from the soil by the nuke tests is quite interesting. Area 51 was supposedly cleaned up from the toxic waste. Many people from the Las Vegas area worked there. Check it out. Sorry – no aliens. In my general region, this map is very much incomplete. Off the top of my head there is Fort Belvoir and the Marine Corp Base at Quantico. I wonder what other places are MIA. Would love to see this overlaid with other government no-go facilities (those referred to as “restricted area” regions). Quantico is there. And is Fort Belvoir. Look in the top mini map on the right side. You can also get a hard copy of this on Amazon if you’d like. 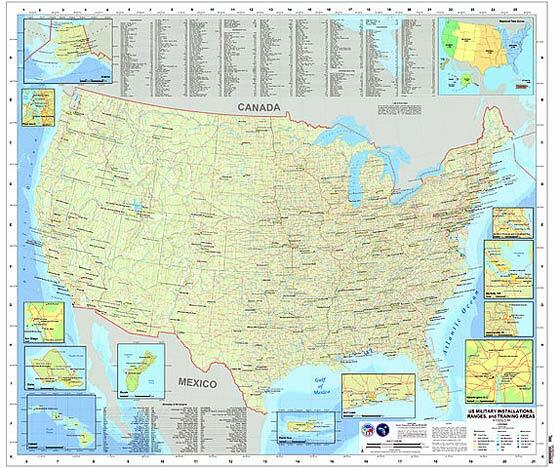 Arkaden: I see a post where you note that the map of US Military Installations is available from Amazon. I am having trouble finding it. Can you help. This is for a present for my brother who is autistic and fascinated with all of the US Military bases across the US. Thanks so much. Anyone know what MTCH stands for (as in MTCH Guernsey in Wyoming? Maneuver Training Center – Heavy . If you zoom in on the large image there’s a legend for all the acronyms at the bottom. Probably not the best idea to save this on your hard drive. Print it off if you want to keep it. Just think how easy it would be to declare someone a person of interest. Imagine the article: “Local man accused of conspiracy to commit terror after files found on personal computer including a map of all military installations.” Paranoid? yes i am! Just curious what you all find useful with this information? Just looking for ideas.. Not sure how to process this info would they be places to stay away from or go to in a SHTF situation. I guess it depends just wondering if I’m missing something.